Features：Bomb Detonating and confidence leaking, resulting from Road-side Remote Control Improvised Explosive Device(RCIED) have been tremendous challenge in many parts of the world. Tangreat solutions—WF-VIP JAM6 is a High Power DDS Convoy Jamming System,Bomb jammers, Portable Rf jammer,Portable Radio Jammers,Vehicle bomb jammer,implementing the most effective and reliable RF jamming technology and equipped with a fully-integrated broadband jamming system. WF-VIP JAM6 can cover, continuously and simultaneously, all the RF communication Frequencies 20MHz-6000MHz. It will be the best solution to defend VIP convoy for vehicle mounted and some other big area jamming quickly to be set up, like military base, important sports events and international summits etc. WF-VIP JAM6, full portable multi-band DDS Jamming system, is designed with a ruggedized trolley type case,highly mobility. 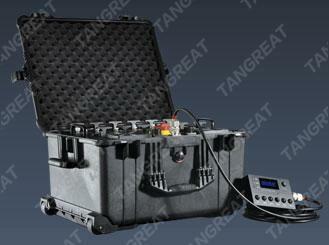 This device is configured with 6 different jamming modules, the jamming frequency can be morethan 20Bands. Six jamming frequency modules can be up to 600 watt output power maximum. The WF-VIP JAM6 is very easy to be installed and operated. The device can be powered by AC mains or a suitable DC power source. The general design of the system meets military requirements and international quality standards. ●Upgraded jamming signal source (DDS technology) to provide utmost efficiency. ●Field programmability for rapid adjustment frequency and output power. ●Fully modular compact design with extremely high efficient cooling system provide very good system stability even in hard climatic conditions. Also easy for maintenance, repair and upgrade. ●Jam up to six different jamming modules simultaneously, and cover up to 20 different frequency bands. ●Each module with LCD display to show its working frequency ,output power and etc. ●Increased total RF output power up to 600 watts. ●Equipped with a wired remote control unit. The operator can ON/OFF each module through the wired remote controller. ●Fully portable trolley-type case. Easy to be carried. ●Supplied by AC mains or DC power source. ●Backup battery system or generator system can be optional. ●The jamming system with an active smart cooling system in a continuously cycle working. military and civil applications in order to provide the best individual solution. Based on its modular design and configuration our digital jammer can be easily operated,upgraded,serviced,repaired and adapted to its required use. Back to Portable Bomb Jammers for more choices.